Right, so today looked to be a fairly ordinary day, not to be so! We arrived in Plett and spent the middle part of the morning at Market Square with some pretty friendly people after which we checked in to the stunning Stone Cotttage (I will post something about this awesome spot later when I can get better pics with better light). But what was truly the highlight of today and a highlight of the trip in a completely different way, was heading out to Tenikwa Wildlife Awareness Centre. Tenikwa looks after a number of threatened and endangered species of animals from blue cranes through to Leopards and Cheetahs with two main goals in mind, to rehabilitate mistreated and hurt wild animals and to create awareness of the plight of Africa’s wildlife to the public. 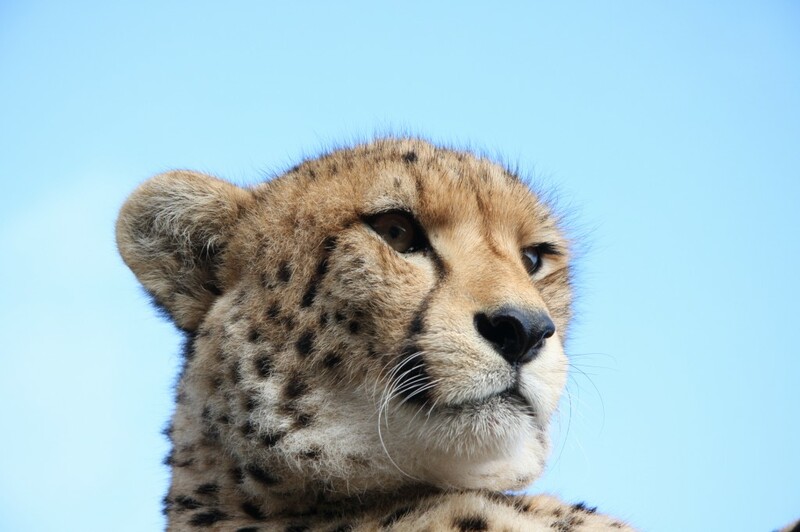 To do this they keep a number of animals (namely the cheetahs who have a naturally more social and relaxed demeanour) which they have reared by hand so to become completely at home with people. This helps the public get close to them to gain an experience of just how amazing these animals are and to develop an appreciation for the preservation of these great species. We were first taken round the various enclosures where African Wild Cats, Cervils and Carakals are kept, we were lucky to make it there at feeding time so the cats were very visible. Our very informative guide Sizwe filled us in on all the most interesting facts about the plight of these animals. He has an amazing story too from starting as a Gardener at Tenikwa, he has worked his way up to becoming head guide, buying his own car and house all with the loving assistance of Len & Mandy Freeman, the owners of Tenikwa who too share Sizwe’s passion for these beautiful creatures. Once we were done there, we walked through the bird enclosure and got to get really well aquainted with a family of blue cranes who were very interested in what we were carrying (cameras etc etc) and took great pleasure in seeing if they could get a rise out of us by squawking, running and dancing. From there we were on to the best part, actually walking through the veld with the cheetahs. We took Zimbali, a female and Chester a male out for a stoll, well rather, these awesome and inspiring creatures took us for a walk, you can’t tell a cheetah what to do! It is just about the most incredible experience to take one of these animals you’ve seen hunting antelope on wildlife documentaries out on a leash and just to have some really quiet and intimate time with them. It was such a priveledge to run our fingers through their coats, feed them water from our hands and sit quietly alongside them as they surveyed the horizon. It is incredibly hard to put this experience into words as hardly a word is spoken there, just the silence and the oneness with nature, you simply have to go and do this once in a life-time experience. Visit their website for more info. Check out our pics on our Flickr page as well. Go for it, I promise you will not regret it! Next, we witness some extreme jumping, go swinging from the treetops and report on the funkiest place to stay in Plett!